← Time to make art? Little Jake Royce hated his chicken. He wanted a dog, the same as Billy had. His Ma said “If Billy jumped off a bridge, would you do that too?” Little Jake was only four but he already knew not to answer that question. There were some questions that had no answers. There were some, however, that if you didn’t answer you got a spanking. But not at Little Jake’s house. They never spanked him, never would. Ma and Pa would talk to him if he broke some house rule. They’d use reason and explain how he was violating the social contract. They’d express how sad they were about his poor choices. This was of course when they actually noticed what he was doing. Most of the time they let him do whatever he wanted. His parents had both been raised by missionaries. While they liked the wildness of not having a fixed address, they couldn’t stand the rules. Do this. Don’t do that. Whether it was about God or chores made no difference. They both craved unending vistas of freedom as children, so when they finally had a child of their own, they gave it to him. Except when it came to that chicken. In general, he could do whatever he pleased. He could stay up as late as he wanted, learn or not learn his numbers and letters whenever the mood struck him, or eat hot dogs and popcorn for three weeks in a row. They wanted him to be free to live his life. He still wasn’t potty trained and they were delighted, saying it was oppressive to insist a child do anything he wasn’t ready for. Of course, how could he be ready? He didn’t even know it was an option. He thought it was normal to poop wherever and whenever you wanted. He thought that his parents didn’t need to go as often as he did because they were so big. They had more room to store it. He never understood what they were doing when they said they were going to “step down the hall”. The bathroom was where you had a bath, and that was it. Not like he had one of those very often, either. But the chicken was not a debatable issue. 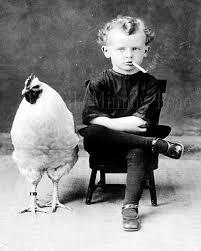 If he had to have a pet, it had to be a chicken. Both his parents were allergic to anything with fur, so dogs and cats were out. Even hamsters weren’t okay. Ferrets weren’t even considered. Even if they didn’t have fur, the smell was a real turn-off. Hattie the hen and Reggie the rooster lived next-door at the co-op. Little Jake liked Hattie better (when forced to choose between a rock and a hard place), but his parents thought it was like supporting an indentured servant to have a hen – all that egg laying. She wasn’t free like a rooster to their minds. So that Monday, Reggie the rooster came home, seemingly pleased as punch to have a whole yard to himself. It didn’t take long for him to make a roost for himself in Little Jake’s favorite climbing tree. His parents took it as a sign that they were going to get along famously. Little Jake took it as a sign that the rooster liked pooping on his head. This made Little Jake think that maybe it was time to learn how to use the potty. He couldn’t be upstaged by a rooster. Abe was unsure what to wonder about first – the fact that this toddler had a cigarette, it looked like he rolled it himself, or that he was being called by his first name by a four-year-old. Was the problem simply that he acted like he was an adult, or was it something more? It was all too much. Maybe was time to retire. Or maybe it was time to talk to the matriarch of the Royce clan. “Being free” was a great concept until it got weird. Maybe she didn’t know how “free” her great-grandchild was being raised. Could be that his parent’s trust fund needed to be tightened up. Maybe they’d stop living in La-la land if they had to pay their own bills for change. Abe always said that it did no good to children to give them a free ride in life. He was all for sparing the rod but not for spoiling child. A child with no direction and no boundaries wasn’t any good to himself or anybody else. Just as Abe released the shutter, the startled chicken released a loud squawk and an even larger splat of poop on the studio floor. Little Jake looked at the chicken, then at the horrified look on his parent’s faces, and decided that this chicken thing might just work out after all. This entry was posted in Stories and tagged black and white stories, chicken, homeschooling, short story, unschooling. Bookmark the permalink.